In Nagaland, though the BJP-NDPP alliance failed to secure a majority with the state throwing up a hung Assembly, the party’s participation in the future government looks certain. The BJP on Saturday demolished the communist citadel of Tripura, winning a two-third majority with ally IPFT and ending 25 years of uninterrupted rule of the CPI (M)-led Left Front. The saffron party, which did not have even a single councillor in all of Tripura, had secured less than two per cent votes in the 2013 polls. The ruling NPF, which emerged as the single largest party, extended invitation to the BJP join the new dispensation, though the BJP-NDPP combine may be able to form a government with help from smaller parties like NPP, JD(U) and an independent. Meghalaya too gave a fractured verdict with the ruling Congress as the single largest party with 21 seats, nine short of a simple majority. All three states have 60-member assemblies but polling was held for 59 seats each due to various reasons. 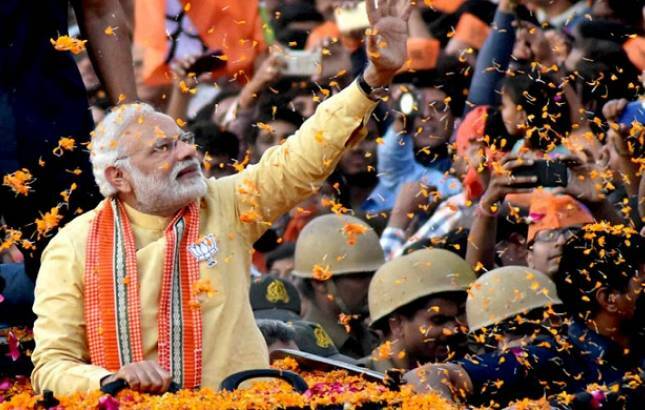 “It is a journey from no one to number won, from “shoonya to shikhar” (zero to top),” a jubilant Prime Minister Narendra Modi said addressing BJP workers at the newly constructed party headquarters in the national capital referring to the giant leap of the party in the Northeast. In a series of tweets on the outcome of Assembly polls, Modi said the victory of the BJP in Tripura was not ordinary. “This journey from “Shunya to Shikhar” (zero to the top) has been made possible due to a solid development agenda and the strength of our organisation. I bow to every BJP karyakarta for working assiduously on the ground for years,” the prime minister said. Modi also said that people are reposing faith in the positive and development-oriented agenda of the NDA. Though the BJP secured a majority on its own in Tripura, winning 35 seats, Amit Shah told a press conference in the national capital that it will form government with ally Indigenous People’s front of Tripura (IPFT), which won eight seats. The CPI(M)-led Left Front could manage just 16 seats. While the unprecedented consolidation of Bengali and tribal votes was seen as the reason behind the BJP alliance’s triumph, the CPI(M) accused it of using “money and muscle power” to win the elections. “The BJP used money and muscle power and managed to bring together all anti-Left forces,” CPI(M) general secretary Sitaram Yechury said. Though the ruling Congress emerged as the single largest party in Meghalaya, it failed to secure a majority, winning 21 seats. The party could not open its account in Tripura and Nagaland. The BJP could win just two seats in Christian-dominated Meghalaya, but its North-East Democratic alliance partner National People’s Party clinched 19. Together they equal the Congress’s tally. Smaller parties that won 13 seats and three independents would play a decisive role in government formation. Senior Congress leader Kamal Nath, who was despatched to Shillong to explore ways of forming a Congress-led government, said the party had the support of MLAs necessary to prove majority on the floor of the Assembly. “Congress being the single largest party should be invited by the governor to form its government. We will prove our majority any time the governor asks,” he told TV channels in Shillong. Nagaland also gave a fractured verdict with no party or pre-poll alliance having a majority. The BJP got an informal invitation from NPF leader and Chief Minister T R Zeliang to join the new government. The NPF, is the single largest party in the House with 27 seats. The BJP-NDPP combine has also won 27 seats and are leading in one each. The NPP of Conrad Sangma, a North-East Democratic alliance partner of the BJP, has won two seats, and Bihar Chief Minister Nitish Kumar’s JD(U) one. If the BJP-NDPP alliance wins the two seats where their candidates are leading, its tally would go up to 32, two more than the magic figure of 30. The BJP had parted ways with the NPF just ahead of the polls and joined hands with the newly launched NDPP of three-time former chief minister Neiphiu Rio, also an old Naga People’s Front hand. Zeliang, the NPF leader, said his party continued to be a part of the North-East Democratic alliance led by the BJP and hoped the saffron party will form the new government with it. “We have not parted with the alliance. I hope BJP will join our government. I will welcome it if they join us. The BJP has two ministers in my cabinet,” he told NDTV. Though there was no official word from the BJP on whether it would be a part of the NPF-led government, Shah had told a press conference in New Delhi that the number of states under the saffron party’s belt has gone up to 21 from 19.